Having missed the march to the Muslim Brotherhood (MB)’s headquarters in al-Moqattam, I arrived late to the site of the protests. There had been reports of clashes at al-Nafoora (Fountain) square, one of the most used entrances to the area of al-Moqattam located at the west end of the district and closest to downtown. Reaching the protest area was difficult, because pro-Muslim Brotherhood supporters controlled the main entry point or at least rendered it inaccessible for some time. I arrived a little after 5 pm from the east end of Road 9, the main road in al-Moqattam. As we drove through, we saw groups of men ascending on foot. We assumed they were MB supporters as there were no women, flags, or signs in their procession. Along Road 9, I encountered a more vibrant march with a greater cross-section of protesters chanting against the MB, saying “Morsi, your day will come.” They were from al-Zelzal (“earthquake”) area of the district and were part of one of the many processions that came from that area. Heavy presence of MB supporters blocking the road prevented us from reaching the guidance office. In order to get through to the protest area we waited for the anti-MB march. As the march approached the blocked road protesters attempted to charge MB supporters, throwing rocks to make way. MB responded in kind but they were eventually pushed back. Shortly thereafter, shotguns sounded from the MB side echoing continuously. Protesters were pushed back as flying rocks filled the sky. As clashes continued, we attempted to get closer to the area of protest by driving through numerous back alleys, many of which were closed off by residents of the neighborhood. As we made our way closer to the protest area, we asked one of many individuals standing next to a bonfire in a dark street where we were at and what was happening. He responded that he was in his balcony when police started attacking protesters unprovoked and that he was not sure why they had done that. The protest area was at the intersection of Road 9 and Road 10, which leads to the guidance office. Having finally reached an area within walking distance from the main protesting area, the scene was dark and full of smoke. The lights on Road 9 were off and illumination came from several shop signs and bonfires. Protesters were gathered on Road 9 before the intersection, chanting, and socializing. They began moving away slowly when tear gas canisters landed close to where they were standing. Police continuously fired tear gas, and occasionally sound bombs. When police fired more frequently people responded by chanting louder “People want to bring down the regime.” Many women were present walking to and from the front lines. Police vans on Road 10 were near the intersection and behind them were several interspersed lines of Central Security Forces (CSF) troops. A few protesters were on Road 10 at the intersection, but they were mostly throwing back tear gas canisters back in the direction of the police. Tear gas was fired indiscriminately with numerous gas canisters falling inside the residents’ balconies and protesters pointing their laser guns at the smoke coming out of them. A field hospital was set up beneath Al-Dostoor party’s headquarters on Road 9 close to the clashes. A nearby cafe was full of anti-MB protesters. Conversations indicated that protesters were feeling positive about the protests, sensing they have succeeded in delivering a blow despite not being able to reach the guidance office. The protesters were also determined to continue protesting against the MB. A police APC chased protesters on Road 9 as we watched from the cafe. By 9 pm, numbers were dwindling, yet tear gas continued to fill the air. As we drove out of Moqattam, we saw protesters stopping buses that looked like they belong to MB. The street leading out of Al-Nafora square was laden with rocks and glass. Egypt has what they call a Public Prosecutor. His job is to represent the people and attempt to bring about justice. That is not what he does. All sugar coating aside, Talat Ibrahim is a corrupt man who has a history of politicizing 'justice'. So much so that he is now known as the Private Prosecutor. 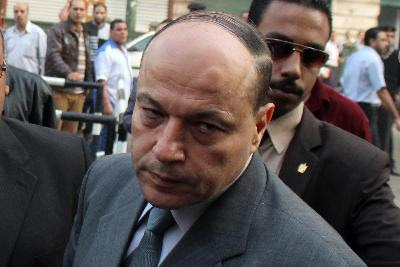 This corrupt official is owned currently by the Muslim Brotherhood. A despicable man who even before becoming Egypt's private prosecutor handed down politicized sentences in Bahrain. This is a man who wrote his resignation due to pressure from his subordinates and then retracted it despite being unwanted among his peers.This is a man who has turned a blind eye to every form of wrongdoing by the Muslim Brotherhood. Not only that but he had asked head of prosecution Mostafa Khater to lock up innocent people so that president Morsi is not proven a liar. When Khater refused, he was transferred to Beni Swaif as punishment. Khater in turn exposed the level of corruption to unjustly lock up people. Morsi lied, and Talat Ibrahim manipulated justice. This is a corrupt regime beyond a shadow of a doubt, and if there was any justice in Egypt, they would be spending time in prison. Here's a subtitled video to shed light on how corrupt the justice system currently is.